Stay focused and precise in the most chaotic environments. A 61-point expanded autofocus system delivers pin-sharp images even in low-light conditions. Versatility that lets you tackle any subject, from weddings to photojournalism and from landscape to portraits. Shoot it all with the flexible, and responsive EOS 5D Mark IV. Get creative. Make unique image adjustments after shooting with Dual Pixel RAW. From the darkest shadow to the brightest highlight, a 30-megapixel CMOS sensor captures fine detail even in the toughest conditions, with a maximum native sensitivity of ISO 30,000. Shoot Dual Pixel RAW files for post-production adjustments like you’ve never seen before. Stay focused, with an expanded 61-point AF system that tracks even the most erratic subjects, and that can be customized to every situation. Accurate exposures come from a metering system so advanced it has its own 150,000-pixel RGB+IR sensor. Anti-flicker technology combats variations in brightness under artificial lighting. In pursuit of the perfect moment, the EOS 5D MARK IV can shoot continuously at 7fps. 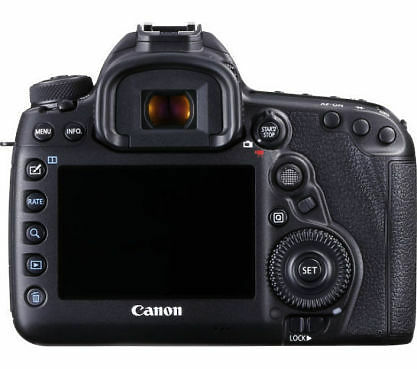 Its viewfinder and user interface are highly customizable, with intuitive touch-screen operation offering new levels of camera control. Add weather-proof sealing and you have a DSLR that’s at home in just about any environment you can think of. Following in the footsteps of its predecessors, the EOS 5D MARK IV once again offers DSLR movie makers new ways in which to be creative. Capture 4K footage at 30fps, from which 8-megapixel still images can be extracted as JPEG files. Or explore different timescales with 120 fps HD video for slow-motion effects and built-in timer facilities for time-lapse movies. Dual Pixel CMOS AF allows continuous focusing – lock on to moving objects with just a tap of the camera’s (or your smartphone’s) touchscreen. 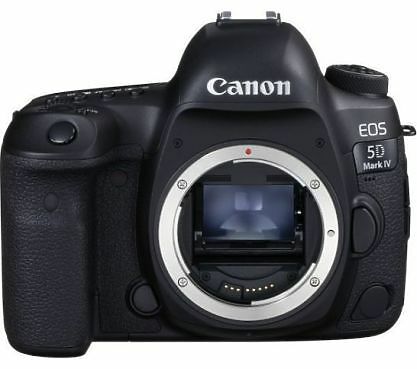 There’s other data in the EOS 5D MARK IV’s files too. Built-in GPS tags images with your location as you shoot them. IPTC metadata can also be embedded. With in-camera RAW processing, it’s easy to produce client-ready JPEGs, and Wi-Fi and NFC connectivity make it simple to send or share them, using either FTP/FTPS networking facilities or your smartphone. Hire the X5 Canon 5D Mark IV from Procam. Best service and rental rates for the X5 Canon 5D Mark IV and all cameras, lenses, sound, lighting and grip.